Clicking your face or the passport icon brings up your passport. 2. Title - you can change your title you own here. 3. Your gang and emblem. This will show up when you apply to join a gang at the gang's(cowboy)/warrior's(Red Indian) lair in a Town. 4. 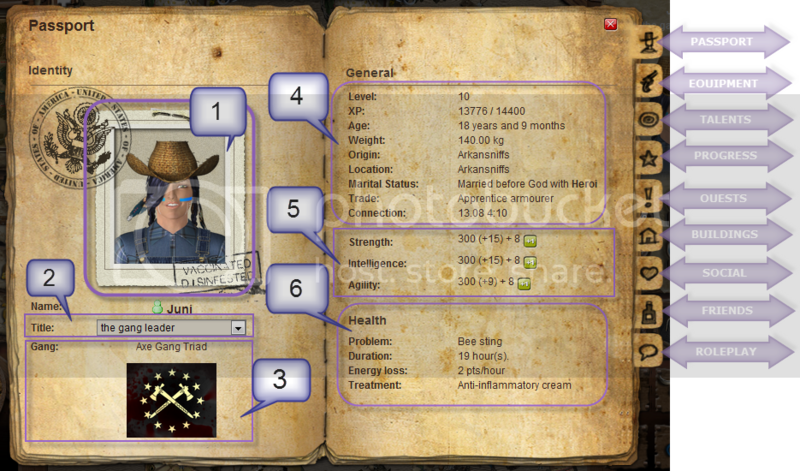 Shows your character's general information on Level, Gender, State. Note: 1 day in real life = 1 month for character age. You start at 14 years old. 5. 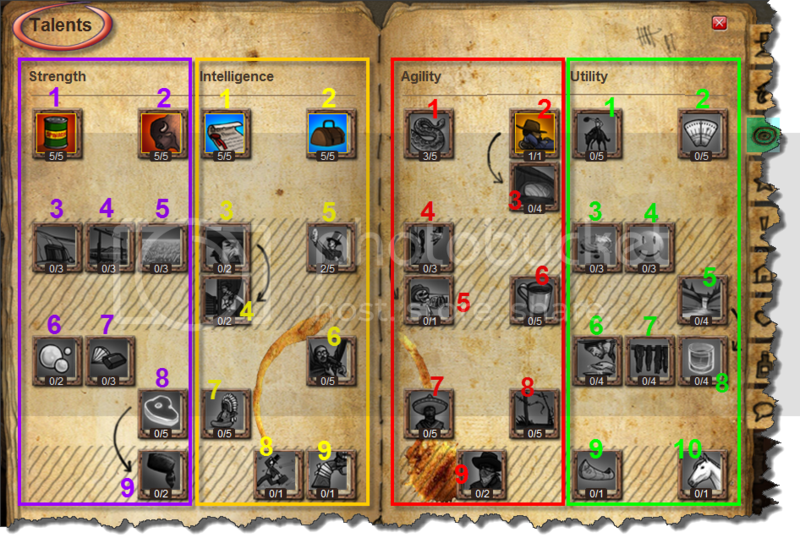 Character statistics - you are given 9 skills points for every level you gain to allocate between the 3 skills. If you have any extra skill points to allocate , there will be a ' +1 ' shown besides the skills. 6. Health : This area shows your current health status. If you are injured/sick, it will show under the character events. Different illnesses/ailments will result in various degrees of penalty to health , morale or energy each hour. For certain injuries, it will indicate that a doctor is required. You have to visit the doctor in your Town to get your injury treated. Send a private message to them in event that none of the doctors have noticed your characters presence in the waiting room. For other minor injuries, the cure will be indicated and you should be able to buy the cure from the 'care' section in shops or markets to heal yourself. 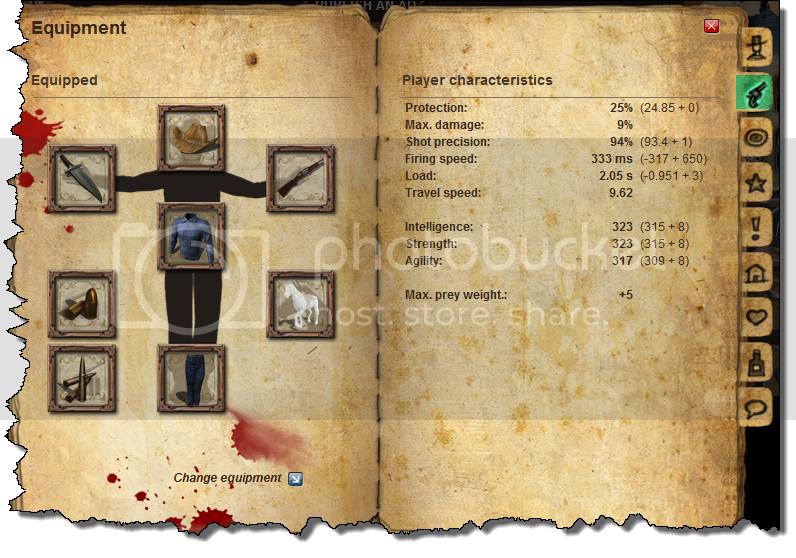 Equipment : Shows what tools/weapons, clothing & mounts are you equiped with. you can refer to this too. This is a special section for your character to gain additional bonus. You receive 1 talent point for use every level. There are 4 category under which you can choose where to place your talent points. Take note that some talent requires another in order to be fulfilled.Hovering over the talents with your mouse pointer will display the requirements for it. 1. Increases your total strength by 1%. 2. Reduces by 10% the chances of having accidents or getting diseases during hunting and fishing. 3. Decreases your shooting needs by 3..
4. Increases the capacity of stables by one animal(s)..
5. Increases the basic production of your crops by 1 unit(s). 6. Increases your chance of fishing. 7. Increases your luck of finding precious stones by 3% whilst mining. 8. Increases by 10kg the maximum weight of the prey you catch during hunting and fishing. 9. Increases your chance of catching a pet or livetsock by 15% whilst hunting. 1. Increases your total intelligence by 1%. 2. Increases weight you can have in your bag by 5.00kg. 3. Reduces the chance of getting robbed by 10%. 4. Reduces the chance of being burgled by 40% when you´re in a building you own. 5. Increases by 1% the amount earnt when haggling over an item. 6. Reduces the taxes taken by the state by 2%. 7. Increases your hourly energy regeneration by 4 points. 8. Reduces the cost in energy when travelling by 4%. 9. Slightly reduces the wear of your equipment. 1. Increases your total agility by 1%. 2. Enable you to sleep rough. 3. Increases your hourly energy gain by 7 points when sleeping rough. 4. Increases the power of your attacks by 1 during shootouts and duels. 5. Pick up a small amount of cash from the body of your enemy after a victorious duel. 6. Increases your speed by 0.50 point(s) during shooutouts and duels. 7. Increases your chance of stealing an item by 5% after a successful pickpocketing attempt. 8. Increases your chance of passing a ranch´s security by 1%. 9. Increases the chances of you not being identified by 15% during robberies or burglaries. 1. Reduces by 2% the chances if having accidents or getting diseases during your activities. 3. Increases your health by 2% every day. 4. Increases your morale by 2% every day. 5. Increases your hygiene gain when washing in a lake or river by 10%. 6. Reduces your hygiene loss by 2 points every day. 7. Reduces your satiety decrease by 2% every day. 8. Reduces your hydration decrease by 2% a day. 9. Gives you the ability to cross rivers and lakes during your travels. 10. Your steed will age twice as slowly with this talent. 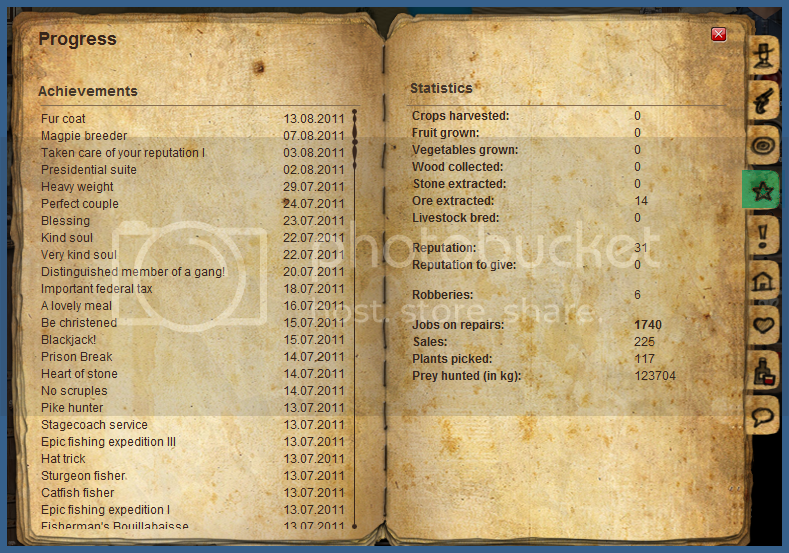 This page shows your achievements as well as some personal statistics. Your quest(s) on hand and its progress. Refer to NPC building. To be updated. I need to get some information about the quest - where can I get any? 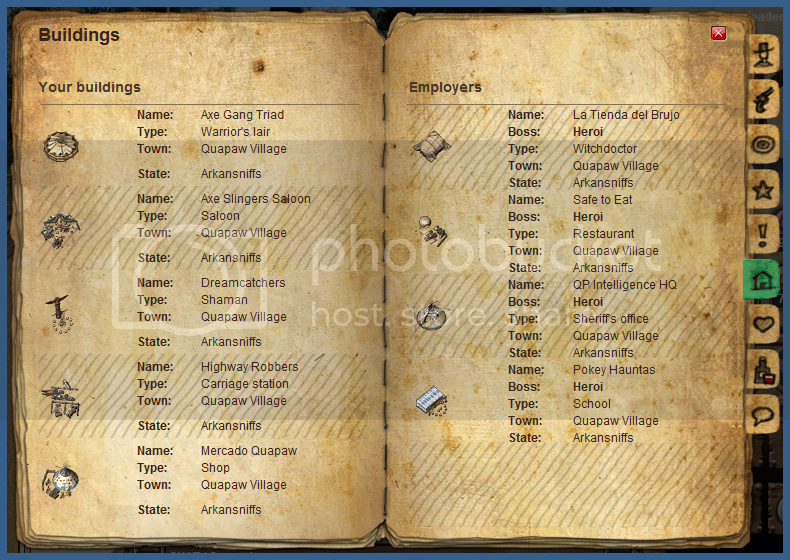 List of buildings that you own and where you hold employment at. 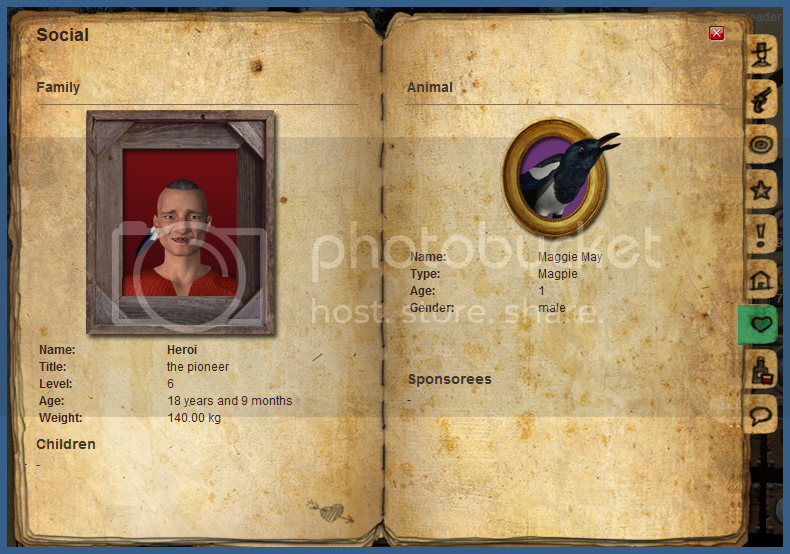 This section shows your marital status and family, as well as your pet, if you own one that is. you can refer to Couple and Pet too . 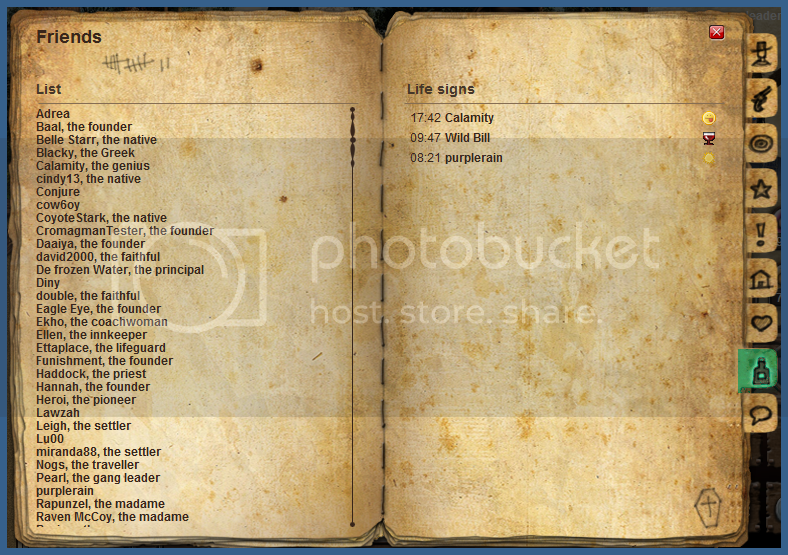 This page shows your friends as well as the "signs of life' received from them. 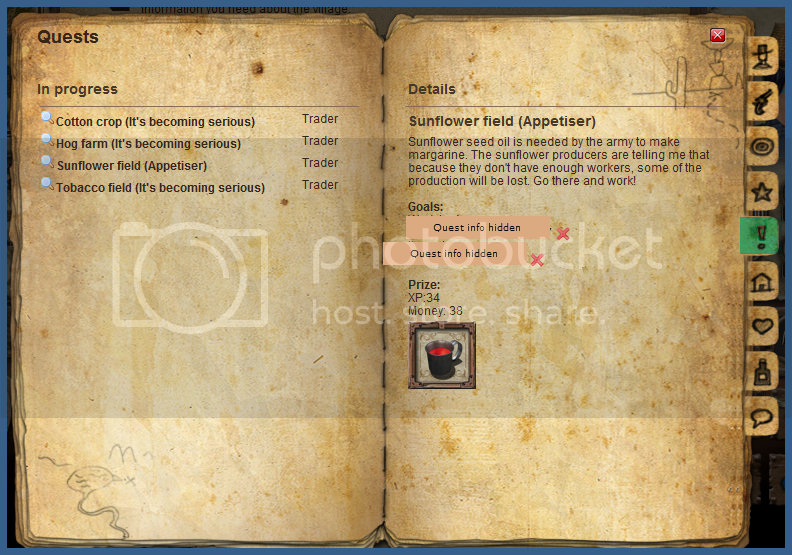 Here you are able to add your role-playing description(s). Remember to keep it clean and tasteful! 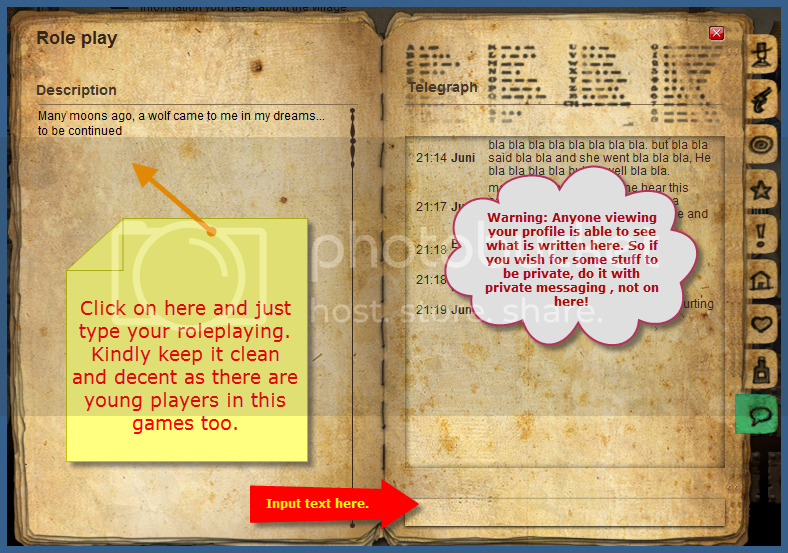 On the right, where the Telegraph is, you are able to interact with anyone who view your profile. Leaving a nice welcome salutation to a new neighbour in town is a great start!